This fall pizza celebrates the best produce of the season! 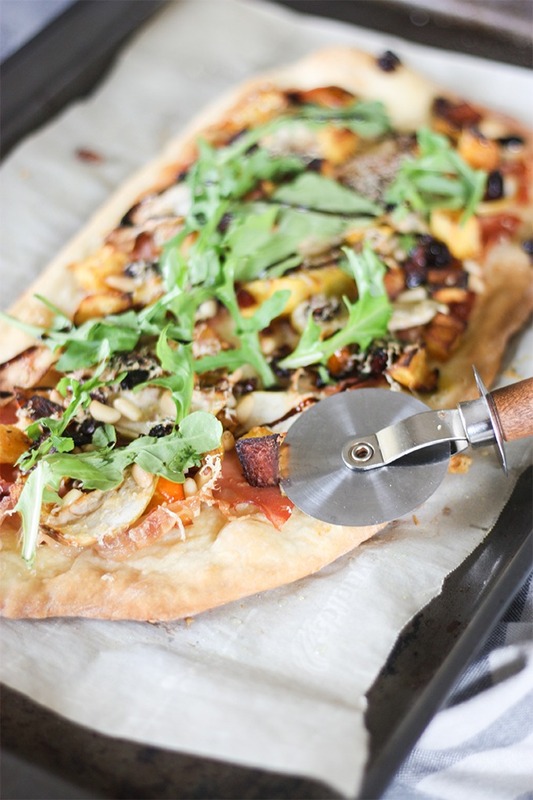 A homemade pizza base topped with acorn squash, prosciutto, finely sliced apple and other fally goodness! Perfect for a date night, or girls night in! I’m back! Not that I was ever really gone, I just needed a week off from posting to sort out my life and to get on top of some projects! Sometimes just having a little time off can make the world of difference! This time last week, I started this post, staring into my screen with not an ounce of motivation or inspiration to complete it! To me, that was a tell-tale sign that I needed to take a moment to step back, get my creative mojo back and post once I was feeling back to my usual self! Which I TOTALLY AM! I actually had the past five days off work. Wednesday and Thursday was no school for students, so I didn’t get a call in for a job, and Friday was veterans day! Did I get anything done at all? Barely! Do I feel relaxed and refreshed? Absolutely! I spent a blissful 5 days catching up on some work that I have for some clients, watching multiple episodes of British cooking shows on Netflix and hours chilling with the Arch man, teaching him some new tricks and skills. In saying that however, for a short time I will be cutting down my posts to once a week. I hate doing this, but with trying to be a good dog mum, wife, work full time and still maintain blog posts is just a little overwhelming right now! But let’s get down to business and talk about this fall pizza! I love this pizza for many reasons. it’s perfect for a date night or girls night in. Fire, wine, pizza you feeling me? I absolutely love making my own homemade pizza, and Adam and I do it quite a bit! We’ll often have friends around for a pizza night on a Friday night and it is really no hassle or fuss at all! 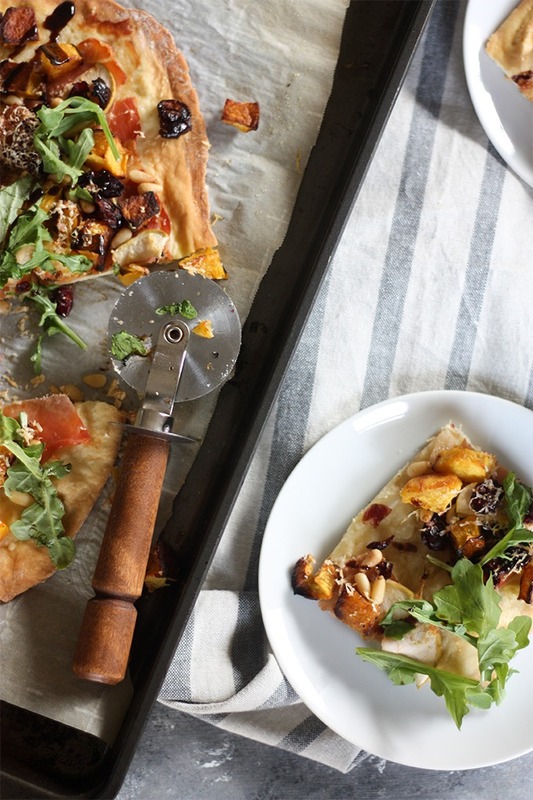 This fall pizza is super easy, the hardest and most time confusing part is roasting up the acorn squash. If you can’t find acorn squash, then butternut squash or Kent pumpkin (if you’re in Australia) would work perfectly. This pizza is earthy, but with a slightly subtle sweetness to is and has ALL the textures! It’s creamy, crunchy and so, SO delicious! 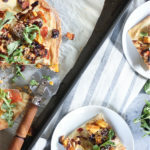 This harvest pizza is a great way to showcase some beautiful seasonal produce and incorporates flavours and textures that will blow your mind! Make it today! Doooo it! Now! Go! On your way! Oh and tag me on Instagram @thehomecookskitchen if you make it, I’d love to see your work! Hosting A Pizza Party? Try these! An easy pizza using some of my favourite fall produce. 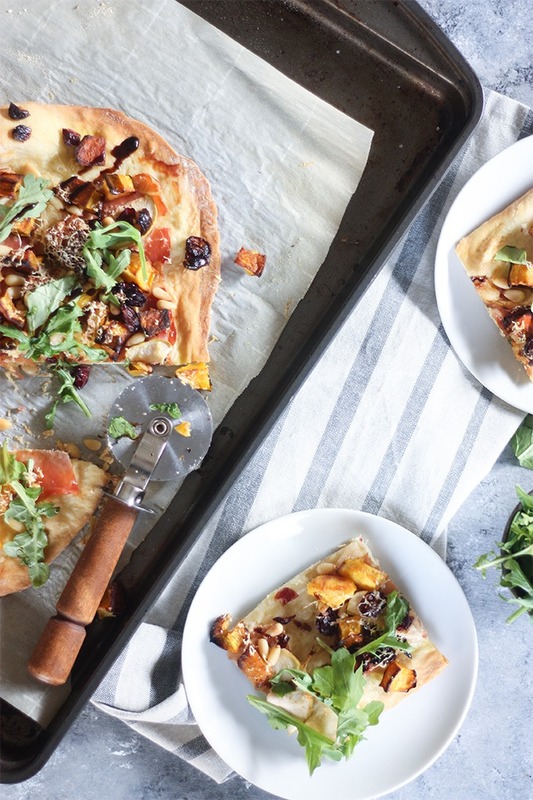 This fall harvest pizza is perfect for your next date night or girls night in! Drizzle a little olive oil over the base. Top with prosciutto, then add acorn squash and apple. Sprinkle over pine nuts, cranberries and remaining cheese. Top with arugula and a drizzle of balsamic glaze. Waiting patiently for me to finish up a photoshoot! Sometimes a little break is just what the doctor ordered :). I’m glad you’re feeling refreshed, and really glad you posted this amazing pizza! It just screams FALL! 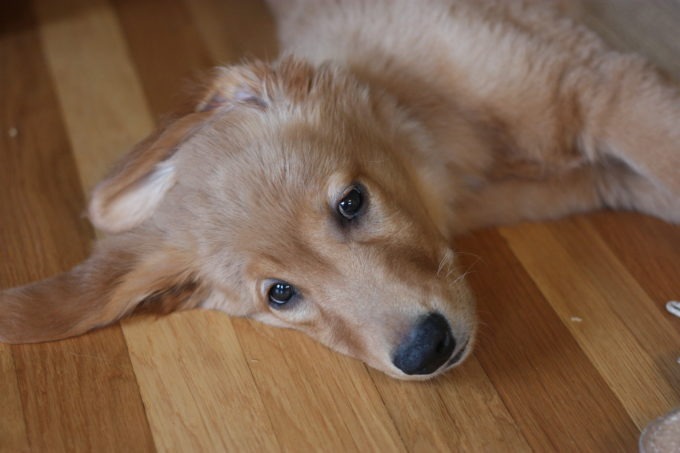 Archie is such a little doll. Say hi to him from Cookie and me! yeah I agree! didn’t want to totally burn out! I didn’t realise just how much time Archie would take out of my day! among pats and training productivity is gone out the window, but I kinda love it! thanks for the love Kelsie!!! your latest post looked amazing! Looks great, Georgie. I love thin crusts and everything you have going on toppings wise is simply delectable. I can honestly live on pizza for weeks. Hope you don’t mind I will opt for fall ales:) Cheers! I’m so glad you got some time to yourself!! I haven’t posted yet this week either and I’m keeping off Instagram because I had a wicked cold and just needed to sit and stare at Netflix blankly 😉 Sometimes you just need a little R&R!! Speaking of R&R, this pizza would be perfect for a night of relaxing!! Very fall!! oh no! get better soon! nasty winter/fall colds! hope you can take some time for youself as well! it makes the world of difference! This looks so freaking delectable!! 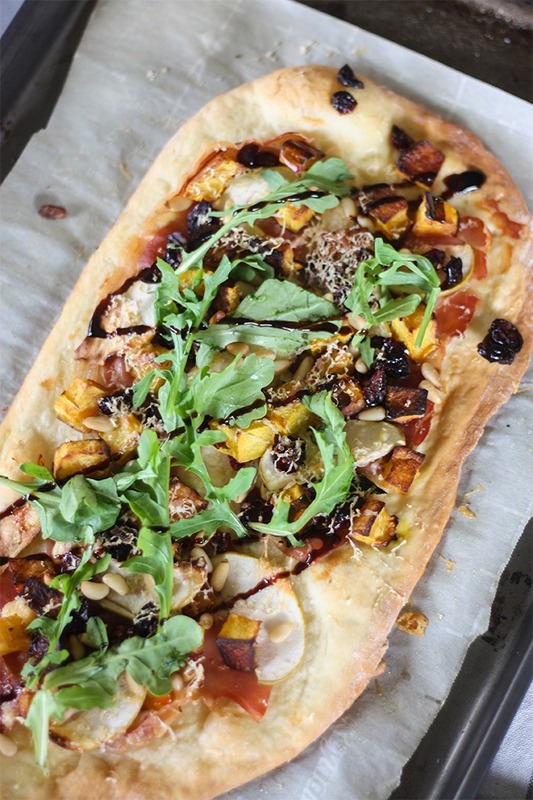 Love all the fall flavors featured on this elegant pizza. Thank you! it really is the best of the best for fall produce! I love pizza nights!And this has got everything going for me!! I love all the toppings and can’t wait to make it :). And it’s totally okay to take some time off to rejuvenate yourself! Pizza night are the best aren’t they! sometimes it’s so nice just to take some time away from everything! feeling much more refreshed and ready to go again! Yummy! This is an ultimate pizza recipe for the whole year long, Georgie. Can’t wait to give it a try. Should I use fresh or frozen cranberries? oh shoot I just realised! use dried cranberries! i changed the recipe! 🙂 happy thanksgiving!